From the wording of the exhibit alone, it is clear that Fassbinder’s work is incredibly controversial and deeply personal. He created his own universe in which he made films critiquing and discussing German society and his own troubles, of which he had many. Fassbinder grew up in a troubled household in post-World War II Germany. He was left with an aunt and uncle as an infant before returning to live with his parents in Munich. Both of his parents, however, were workaholics and are said to have ignored him a great deal. In 1951, his parents divorced. Fassbinder continued to live with his mother in Munich, although she was diagnosed with tuberculosis and was away for a good amount of his childhood. After unsuccessful attempts at boarding school, Fassbinder lived with his father, with whom he did not get along. After he moved out, Fassbinder’s frantic filmmaking began and did not stop until his death. In less than 15 years, he acted in 36 films and produced 24 plays, in addition to shooting 40 feature films and two television series, among other ventures. Much of his work reflects more than just the problems in German society and Fassbinder’s lonely childhood. As a young adult, Fassbinder was volatile and uncontrollable, and not just from having such an independent and fragmented childhood. Fassbender had experimented with men and women all throughout his life, although he was married to Ingrid Caven from 1970 to 1972. Fassbinder orchestrated a world in which there was no separation between his personal and professional lives — he cast family, lovers and friends as roles in his films. His mother was even an actress in some of his pieces. The exhibit is said to emphasize the influence Fassbinder has had on artists since his death. Within the context of the art world, the personal and gory details of Fassbinder’s story have become more irrelevant. Artists, one would hope, are more likely to examine the themes of Fassbinder’s work instead of his personal troubles. 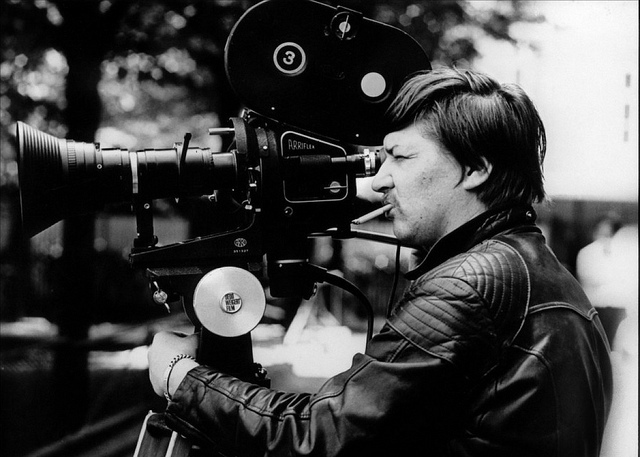 Although there is an undeniable connection between Fassbinder’s experiences and his work, the art should theoretically be taken and studied more seriously. Fassbinder is one of those public figures who transcends the bounds of artwork and becomes a cultural phenomenon. But why? Is it solely because of the difficult themes he explores in his work? Or is it because there is something addictive in seeing the products of a mind so troubled? Fassbinder’s work is beautiful, but the continued celebration of his life and films begs the question: why do typical “tortured artists” consistently gain cult-like followings? Kurt Cobain is another even more culturally persistent example. While he was a talented musician, his life and suicide have become commercialized to the point of seeing his face printed on graphic tees around the world. It is very possible that more people are aware of his personal tragedies than his music. Fassbinder’s is a similar situation, although more removed from the American eye because of his German identity. It is unfortunate that personal tragedies often overpower the artwork of many troubled artists. There are, however, a number of reasons why people are so drawn to tortured artists and their stories. There is an element of the unnerving human tendency to enjoy destruction, which is obvious when you turn on the news. There is often nothing featured but tales of death and terrifying crime. More importantly, there is something relatable in these artistic figures. They have a unique combination of imperfection and genius. Their flaws, which are made public by their profession, attract people. Most often, as in the case of Fassbinder, there is also an element of intelligence that awes audiences. Fassbinder — with his broken childhood, personal turmoil and rare genius — is the epitome of the combination. While there are many artists of all disciplines that deserve to be celebrated, Fassbinder’s exhibit is still a positive event in the art world. His work and life story speaks to many people in an unusual way. Future generations should have the opportunity to experience it as much as the older ones have. If you happen to be in Berlin over the summer, go check it out.